In the last window of Update Assist, you confirm all of your settings and generate the application files. The following image shows the Summary window. 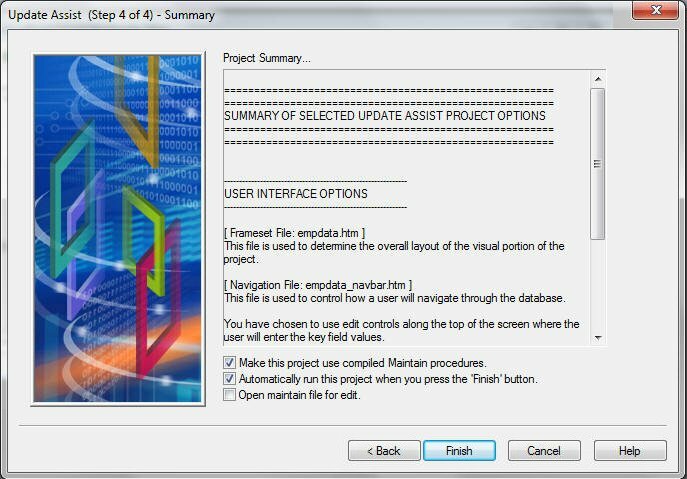 Lists the files that Update Assist is creating and summarizes the operations the project can perform on the data source. To make changes, press the Back button until you reach the screen containing the information you want to change. Select this option when you are finished debugging your project. Compiled procedures run more quickly, but it takes time to compile them. Clear this option if you do not wish to run the project immediately, for instance, if you wanted to perform further editing on your project files. Immediately opens the Maintain file for editing in the Maintain Development Environment (MDE).